China is emerging as a smart grid powerhouse, both in terms of its massive market potential and as the source of new competitors against the North American and European giants that now dominate the industry. Tuesday brought two news items that bridge both divides. 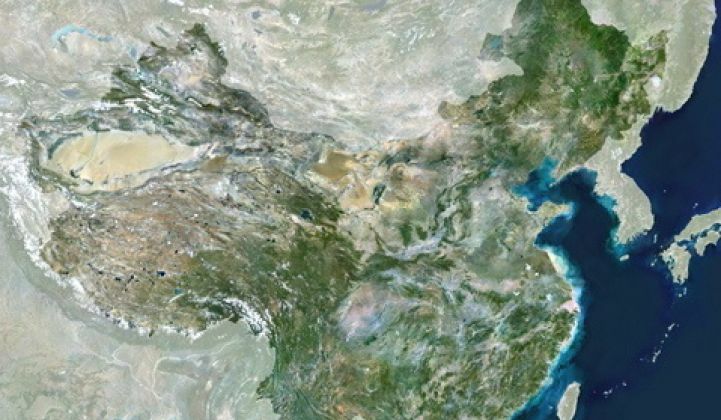 Let’s talk about China as a smart grid market first. On Tuesday, smart meter maker Echelon announced a new joint venture with China’s Holley Metering, aimed at delivering smart meter technology to meter makers throughout China’s market. The two companies plan to invest $4 million in the venture, which will be 51-percent owned by Echelon. As the world’s most populous country, China is going to need a lot of smart meters -- an estimated 300 million or so over the next five years, according to government targets. But key government-controlled utilities like State Grid Corp. of China (SGCC) and Southern Grid also want their smart meters to cost less than $50 apiece, which is much lower than the $150-and-up ranges seen in North America and the $100-and-up for European smart meter projects. Holley and Echelon have been collaborating since August on putting Echelon's technology in meters from Holley, which ships 20 to 30 million meters per year, Echelon CEO Ron Sege said in a Tuesday interview. But Tuesday’s announcement expands the potential to sell the technology to other meter manufacturers -- an important point, given that China's government is expected to seek to split the market amongst multiple vendors, he said. "Obviously it’s a huge market, and we’ve got to find a way to compete in it," he said. This year will see pilots of the technology, as the partnership seeks approval from SGCC for its technology to be deployed across the country, Sege said. By 2013, Echelon hopes to see revenue coming in from the partnership, he added. Holley intends to design Echelon's powerline smart transceivers into meter communications modules, and will also adapt Echelon's Control Operating System (COS) to suit the needs of China’s market. Unlike North American utilities that are using wireless communications to link meters, China has focused on using power lines themselves to carry data back and forth. The government has said that half of its meters will be PLC-enabled by 2015. While Chinese incumbents like Ningbo Sanxing Electric, Wasion, Hi Sun Technology, Linyang Electronics and Holley are expected to dominate China's smart meter rollout, foreign technology may well find its way inside those meters. Norwood, Mass.-based Analog Devices is working with China’s Nanjing NARI, Milan, Italy-based Accent is working with Chinese PLC comms maker Topscomm, and Singapore-based Semitech is putting its PLC chips in meters built by LangFang Gao Shan for the Chinese market, for example. We’re seeing some other contenders for China’s smart meter market, including recently unstealthed startup Glen Canyon, which is promising to deliver its smart meters at a price of $25 apiece, and has a 1.5-million-meter order from Chinese partner Beijing Guozhiheng Power Management Technology Group Co. Indeed, Glen Canyon Partners, the venture capital investment group that formed Glen Canyon, formed a joint venture with Holley in 2010 aimed at the “electric utility measurement systems” market. While big smart grid players salivate over China’s market potential, we’re seeing Chinese companies emerge as contenders in smart grid markets outside the country’s borders, as well. Chinese telecommunications equipment giant Huawei staked its claim on Tuesday, announcing that it would work with Landis+Gyr to collaborate on technology to serve the United Kingdom’s plan to roll out 47 million smart meters by 2020. The two companies plan to work on a "universal communications hub" to connect utilities to smart meters at customers’ homes -- a key feature of the U.K.’s deregulated power market, where retail electricity providers can switch their meters in and out of customers homes as often as once per month. Landis+Gyr, the Swiss smart meter giant bought by Toshiba for $2.3 billion last year, has been named as a contender to supply U.K. utility British Gas’ smart meter deployment, along with German-based smart meter giant Elster. British Gas has picked San Mateo, Calif.-based smart grid communications provider Trilliant for its initial 1-million-smart-meter rollout, the first of what’s expected to be a 16-million-meter deployment. The U.K. government has also launched an open bid for $7.5 billion in communications contracts, with players like Alcatel-Lucent, Ericsson, Vodafone, O2, and a consortium including BT (British Telecom) and U.S. smart meter maker Sensus in the running. Then there’s the IT framework to connect these regional smart meter and communications networks into a nationwide repository of data, which is being targeted by the likes of IBM, Logica, Siemens, Atos and others.